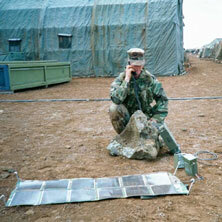 Global Solar’s portable solar chargers are lightweight, convenient, silent, easy to use, and provide the power you need to extend your mission! 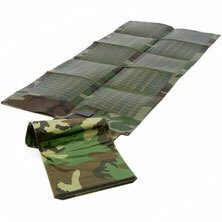 The 30, 62 and 124 watt solar chargers provide a clean, renewable portable power option for keeping batteries and electronic devices charged while in the field performing your tactical operation. Many electronics today require increasing amounts of power and continued use of these devices can completely drain a battery in less than 3 hours! 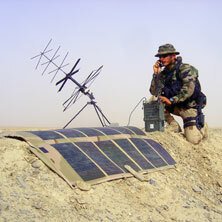 The Global Solar 30, 62 ans 124 watt chargers paired with lightweight rechargeable battery packs can extend the runtime of your BGAN satellite terminal, satellite communications, two-way radios, laptop computers, thermal imaging cameras, GPS, RF directional finders, night vision devices, and laser range finders while you complete your mission. 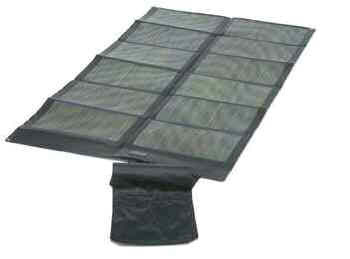 You can depend on a Global Solar panel to keep your electronics charged and running. Great for soldiers, border control agents, special agents, emergency responders (WFR/WAFA), environmental engineers, extreme weather expedition guides. Lightweight and portable. Weighs less than 3.5 lbs (1.5 kg). Built-in reverse current diode protection. Built-in voltage cap on 6.5 watt and 12 watt models. Durable – GSE CIGS cells cannot be broken like common crystalline silicon photovoltiac materials. 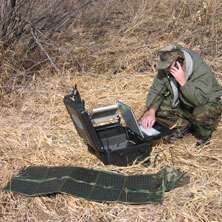 Conforms to military standards (MIL-STD-810). Blends into surroundings; will not reflect sunlight.